These and other verses of the Qur’an inform us about a great flood that took place on the earth. This was such a great flood that it covered a major proportion of the earth’s surface and destroyed a civilization. The traces of a civilization that was annihilated at once and that occurred as a result of a natural calamity, dramatic migration or a war are preserved much better. For, in such calamities, the houses in which humans live and the tools that they use are buried into the soil in a short time and thus preserved without being touched for a long time. And upon being brought to light, important information is acquired about their past lives. Many proofs about the flood of Noah are brought to light through this way. The flood which is thought to have happened around 3000 B.C destroyed all civilization at once and enabled a new civilization to be established. So, clear proofs of the flood have been preserved for thousand years for us to take lessons from it. Leonard Woolley is a very important researcher who researched this flood. He presided of an excavation project that was carried out collectively by the British Museum and Pennsylvania University. The excavations of Sir Woolley were carried out in the middle of the desert between Baghdad and the Persian Gulf. The excavations of Woolley are explained as follows in the Reader’s Digest: An important finding was revealed as they got deeper inside the earth; this was the king tomb of the city of Ur. 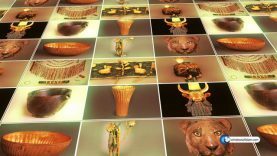 Researchers founded many legendary works of art in the tomb of Sumerian kings and nobles. Helmets, swords, musical instruments, artistic handiworks that were made of gold and precious stones.